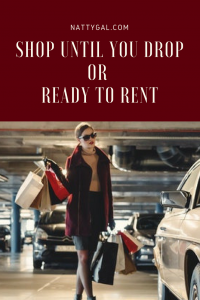 Shop Until you Drop or Ready to Rent? In recent years we’ve seen the Millennial Generation give rise to the sharing economy. No longer is ownership a hallmark of success. From ride-sharing services like Uber to streaming of music and entertainment, this group is forcing retailers to reevaluate the way they do business. Even automaker Porsche is piloting a $2000/month subscription service giving users access to a fleet of cars and SUVs that can be switched out on demand! WHICH SERVICE SHOULD I TRY AND REVIEW? On the fashion front, Rent the Runway kicked things off with a model that encouraged renting special occasion outfits for one time wear. They’ve since expanded to subscription services which encompass everything from formal wear to lounge wear and accessories. It wasn’t long before others decided to hop on board. 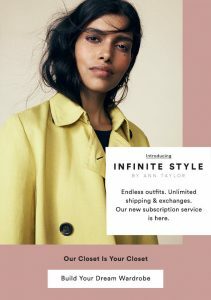 Most recently the mall retailer Ann Taylor announced a new subscription based plan. Below is a summary of the most popular of these services and I’m hoping after reading that you’ll take the poll and help me decide which company I should try out! All of the services listed include an option to buy an item you love at a discounted price. Typically these purchases are final sale only. Rentals include cleaning of all clothes and accessories rented. If you need to launder something yourself between wearings, most companies stipulate that it must be dry cleaned or hand washed. Wide variety of brands including premium labels like Vince, Milly, Joie, Kate Spade, Tory Burch, etc. 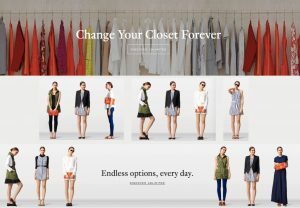 User builds a virtual closet with looks they like but a stylist selects pieces that will ship. User does have the option to approve or swap out pieces before they are sent. 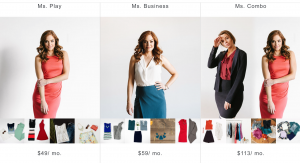 If subscriptions intrigue you but renting does not, check out this post on Stitch Fix for another shopping alternative. Help me pick which rental service you’d like me to try and review! Poll closes Friday, October 27, 2017 at 6:30 AM. Which Rental Program Should I Review for Natty Gal? Awe goodness, I wish I had gotten to this in time to vote! I’ve never tried one of these services, but I would do Rent the Runway or Ann Taylor. Although, I feel like Ann Taylor products are usually reasonable enough, especially with their regular sales, to purchase pieces. Because you are so sweet I will go ahead and count your vote! Agree on Ann Taylor although also find it very interesting as a new business model for established retailers. They may draw in a new audience.